Every city and small town in America has one, says Muskegon Black Foot Soldier Silas Coleman. Every American city and small town has a cabal of whites racial terrorists who sit in positions of authority and who abuse the authority bestowed to them as it relates to the human and civil rights of blacks.Coleman says Muskegon city prosecutor Tony Tague’s findings that the September 23rd police killing of 23-year-old Julius Allen-Ray Johnson was justified demonstrates the workings of this cabal on the local level. 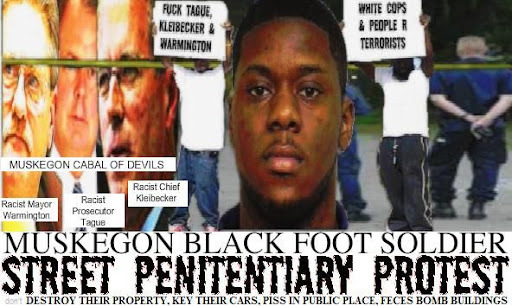 Coleman, who says the same cabal that murdered brother Julius Johnson is now targeting his sister, Tunisia Phillips, has called on all local Black Foot Soldiers to stage a street penitentiary protest.